Dimensions: 48" x 30" x 26"
Dimensions: 47-3/4" x 1" x 13-7/8"
Dimensions: 48" x 1" x 12"
Dimensions: 33.77" x 27" x 61.71"
Dimensions: 60" x 30" x 32"
Dimensions: 33.77" x 44.69" x 61.71"
Pearl District Retail Store Displays are made up of Nesting Tables, 2 Way or 3 Way Floor Displays, and Outriggers for your walls. There are so many ways to display using the various components. You will be able to customize your fixtures to whatever you need in your retail store. This system offers interchangeable hardware, rich finish options, and a la carte components to give you complete control of your look and how you display your merchandise in your store. These displays feature popular Brushed Satin Nickel finished metal frames, with wood bases and shelves. 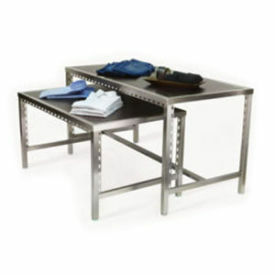 Nesting Tables, 2 Way and 3 Way frames, have reversible shelves. Choose from Blakewood/Espresso, Modern Maple/Espresso, or Blakewood Black/Aspen combinations.